The credit card USB can be as thin as 2mm. And in those 2 mm are fitted an USB connector, a flash controller and a flash memory chip, which is pretty amazing. The USB connector is the interface between the device and your host system, the flash controller is the brain as it gives instructions to the flash memory and the actual flash memory chip that stores all your digital data. The USB Credit Card actually has the same size as a regular credit card or bank card, but they are able to store any files your computer can manage. Not very long time ago, the USB credit cards were about two or three times more thickly than the ones we use today. We could say that they a little brittle and clunky. But with the current Flip Mk 2 and rotate models, the USB Credit Card are very well built, they are tactile and offer the most generous space to be imprinted with your logo or other designs. To resemble even more with a regular bank card, the USB Credit Card’s shape is the most commonly used designs today and they can fit wallets, purses, bags or similar carrying items. So, one of the major advantages of the USB credit card is that you can carry it and store it someplace very convenient. In addition, an USB Cred Card, branded with your company logo, will provide what is called in the credit card industry, a “share of wallet”. It is physical share of your customer’s wallet space, next to brands like VISA, Master Card or maybe American Express. Sharing this space is an advantage over what the regular branded USB flash drive can deliver. If you think of the imprinting space, the standard USB memory drive is pretty limited. Usually this is not a problem. Imprinting your logo or your website address or just your company name, does not require a large space. But for more detailed logos, multiple logos or complex marketing and advertising messages, the USB Credit Card is simply a much better choice. Beside all this, our USB Credit Cards models are also as functional as the rest of the regular USB flash drives. As people have a minimum standard when are using such a storing device, the memory capacities are able to satisfy all needs, going from a mere 64 MB, usually for extremely precise marketing information, to a whopping 16GB, a size for the most exigent customers or very important partners. Also, its internal components make no compromise, the transfer speeds are exactly the same as on a standard USB flash drive. Every year, more and more promotional USB flash drives are gifted. These amazing branded devices can help bring new customers to businesses, to endorse the loyalty of existing client base or simply to create a new brand name. And because they are great storing devices, companies can distribute important marketing information, ensuring the message is delivered directly in the hands of their customers. When the USB flash drives started to be used as promotional items, the choices were pretty limited, most of them being just rectangular pieces of plastic, at one end with a USB connector and a simple removable cap. But as competition started to increase, innovative designs appeared, more customisable shapes and styles, all made from a lot of various materials, like plastic, metal, wood, leather, rubber and so on. If none of the top of shelf models does not quite fit your business needs, fully customisable USB flash drives can be ordered, products carrying your unique design, your unique shape and colour selection. But we can point out one particular branded USB flash drives that captured our clients’ attention. This product is the USB Credit Card. If you wonder why, well, is simple. These credit card shaped USB flash drives are only 2mm thick, which means they will fit in almost any wallet or purse, and look like a regular bank card that people are so familiar with. One of the major advantages of the Credit Card Thin USB is the printing area. This USB memory drive can even be used for complex messages or detailed logos and phone numbers, e-mails or website addresses can also be included. All that information can now be extremely visible, information that a regular USB stick simply has no room to hold on its case. Also, printed credit card USB flash drives look great and they create a deep visual impact. This effect is obtained mostly because they allow a more creative print. Among the benefits of using the USB Credit Card we can count the efficient use in direct mail campaigns, as there are no more packet post charges. Also, the memory capacity can go way up to 16GB, a memory size that can satisfy even the highest marketing requirements. And as for the delivery, their lead time is around 10 to 14 days, depending on your design and stock. These USB flash drives are used to help a business brand to increase in value, to get new customers, re-open relationships with current clients or to distribute pre-loaded information like sales brochures, presentation files or press releases. When USB flash drives were launched the choice of design and memory storage was pretty limited. Early designs were created as simple a rectangular piece of plastic that contained a USB connector on the end and a removable cap. With the immense success that they had on the market and the impact that they produced on the customers they began to evolve very quickly over the years and manufacturers started to create different shapes and designs of the USB flash drives. In today’s world you can purchase these devices in all manner of shapes and styles. They are manufactured from a large range of materials that include plastic, metal, leather, wood, bamboo or rubber. Being used as promotional products not every business or corporation wants to purchase a standard model that doesn’t quite fit their needs. That led to a secondary industry to appear, that designs and manufactures customised USB sticks in any shape requested by the consumer. The fact that is surprising is that the costs to create custom shaped USB memory sticks are only marginally higher than standard shapes. The downside is the creation of these flash drives that usually takes longer. With the design created and customer approval a custom shaped USB memory drive can take up to 4 weeks until it is ready for distribution. The print area is very large on a credit card USB stick compared with the standard USB flash drives models, this gives lots more scope to print detailed graphics or images. Your printable space can have details like phone numbers, email addresses and website addresses. This would be impossible on a standard USB memory drive. The credit card flash drives are familiar since they are exactly the same shape as a regular bank card. The newest credit card USB memory sticks are only 2mm thick imitating perfectly a real credit card being only marginally thicker than a standard bank card. They fit very comfortably into any pocket, wallet or purse that is designed to carry cards. When you print the credit card USB flash drive the results are fantastic, making a real visual impact to the consumers. This is because to the larger print area which allows you to be more creative. These gadgets are the perfect fit for any direct marketing campaign because they are so light to carry they can be mailed out in a standard envelope and by doing this you will avoid larger shipping. Since they have a familiar shape there are mailer packages already designed to carry bank cards that can be used to ship them. Regardless their thin size their memory sizes range from 128MB all the way to 16GB. And business logo printed on these cards can expect to be carried in a wallet, meaning that the brand will get plenty of exposure. Having a large printing area also gives the manufacturer the possibility to attach the USB connector in different ways, giving the users plenty of choices to connect it to a computer. The time used for printing the USB credit cards is between 7 and 10 days. With all the advantages that they offer, they are also no more expensive than other standard USB models. If we look at the previous year number of units sold, the branded USB Cards are gaining more and more popularity. And if this year this trend will continue, the USB Credit Card will overtake even the traditional designed USB flash drives. 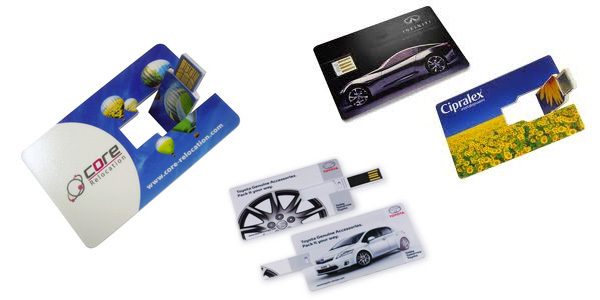 Even thou promotional USB sticks have been with us for a very long time, the Credit Card USB models appeared on the market only 3 years ago and increasing in popularity due to three key features. First, they are only 2mm thick and, because of their bank or credit card shape, they can fit almost any wallet and purse. Second, they are great for posting out to prospects or customers as they qualify for the cheapest letter postage rates. And the third great feature is the print area they provide. This is the largest space designed for printing offered by such a small promotional product. You can print both sides in full colour, right up to the margins of the USB Credit Card. We are talking about images, contact names, telephone numbers, website addresses, email, strap lines and more. A USB Credit Card with a good design will look stunning, will have a very high perceived value and will even provide excitement to the people around the new owner. And even thou it is only 2mm thick, the memory capacity is the same as the other USB sticks, making no compromise. You can still get the 16GB capacity, if needed, and this year, we expect the 32GB feature to be available. Another aspect is that if you decide to purchase USB Credit Cards for your next campaign, you have to think about going for the USB connector that ‘flips’ out of the card, but is still attached, or opt for the version where is slides from the card completely. The slide version advantage is the ease in usage, but its biggest disadvantage is that the USB connector can be lost once it’s removed from the body of the card, rendering the product useless for the customer. Maybe because of this, the more traditional ‘flip’ models have significantly higher sales. Why not surprise your staff or key clients this year with a mini credit card USB Stick? Featuring full colour printing, a retracting USB connector on the underside (so no risk of snapping or distortion to your branding) and a smooth plastic finish, the Stealth Card slots perfectly into your wallet. This is the perfect time of year to send a USB Credit Card. Not only that, but with its slim line design, it will even fit nicely inside an envelope with a more traditional card. Already planned your promotional spending? That’s okay, as credit card based USB Sticks are still relatively new to the market. Chances are if you send out a Stealth Card in the New Year, it’ll still be the first USB Stick in their wallet, putting your brand alongside the things they hold dear, such as their money and pictures of their family!. Despite the fact that there are endless possibilities for sharing information online, business cards continue to be, at least to some extent, a widespread way of passing contact information around. This is the reason why, instead of finding a way to replace them, the inventors of the SwivelCards ingeniously found a valid way to improve traditional business cards, by simply adding a built-in USB port which allows you to share more than just your personal data (i.e. name, address, mobile number, or your e-mail address). With the improved USB business cards, you can practically share any type of information: a photo gallery, a complete resume, a video chat, or business proposals and presentations. Or any other type of digital material that conveys your message. Moreover, if you choose a customized business card model, you have the possibility to efficiently promote and advertise your business and services. Unlike traditional USB drives, USB business cards have a bigger printable area which allows you to show off your logo, thus increasing your company’s visibility. SwivelCards function on a simple principle. When handed out, they look like regular business cards, flat and easy to preserve and carry around. However, due to their folding mechanism, when converted, they unfold a pop-up USB drive that has a sufficient storage capacity to store all the essential data you need to share. With the web key functionality feature, you can even redirect someone to further online data that you can expand, delete, or update anytime. In order to raise funds for additional development of the SwivelCards, its creators are using Kickstarter in an attempt to gather $10,000. The money would allow them to further polish and refine the back-end system of these smart business cards, allowing users to trace when and where the card has been used. Since the business cards already work perfectly, and the operating system has already been perfected, customers can pre-order sets of 200 business cards by simply donating $259. Nevertheless, there are only eight different designs you can actually choose from. If you are interested in a completely customized graphics of your set of 200 business cards, you will have to donate $419. There is absolutely no doubt that the SwivelCards are not precisely cheap. But if you firmly believe that the first impression is the one that makes the difference, these business cards will undoubtedly impress. And considering their stylish appearance and convenience, it goes beyond saying that they will become successful marketing and promotional tools, especially for businessmen who are always on the go and want to enjoy the portability advantage that a wallet-sized USB business card brings with it.